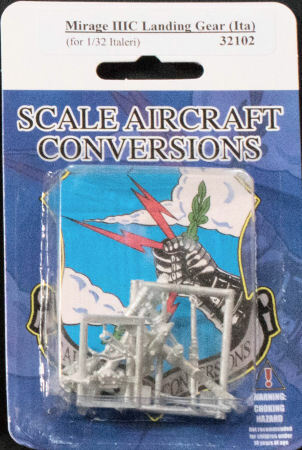 This release is one of many landing gear sets available in 1/32 scale and is targeted for the new Italeri 1/32 Mirage IIIC kit. This set is a drop-in replacement for the kit's landing gear, though cast in white metal to provide stronger legs for your kit to stand upon. This set includes the main landing gear struts, nose gear strut, and retraction arms, all cast in white metal.